I consider it a sheer stroke of good luck that I grew up in Lahore at a location which has been an eyewitness to Pakistan’s political, social, educational, and intellectual history, inclusive of all political movements that ever took place and that involved large-scale public participation. My family home at 5 Maclagan Road faced the red brick British Council building, now a bank, the Commercial Building was on its immediate left, and across the road was the YMCA. On its right side was the famous Pak Tea House, a minute walk from there, the Coffee House, and at a distance of 5 to 10 minutes was all the glory of this city including Tollinton Market, Punjab University (now called old campus), the magnificent Lahore Museum, the National College of Arts, the famous Bhangianwala Toap/Zamzama cannon, then Gol Bagh, a little further Government College, and from there in a loop, the Law College and Oriental College and on to the famous Anarkali Bazaar. Back at my family home, through Nila Gumbad and King Edward Medical College, you could walk on the Mall Road by the majestic GPO, and then walk across the roundabout to be in front of the grand High Court’s imposing structure, and then on to Regal Chowk. Within a radius of about 2 miles, I had the unmatched privilege of witnessing and observing whatever, whenever and wherever anything political, cultural, or intellectual ensued in the overall spectrum of this country. For years I remained at the epicenter of political activism because of where I lived. It was at this central junction of the city of Lahore that I was eyewitness to political demonstrations, chanting mobs and massive public rallies for over 4 decades. It included marches of the Khaksar Movement, Azam Khan’s martial law, numerous political rallies and public agitation in Ayub Khan’s decade of development, and so on and so forth. There I witnessed and observed mob psychology, public anger and its vocal and physical expression. There I watched, before my eyes, violence: the looting of the liquor store at Commercial Building, the smashing of showroom windows and the bashing and beating of political opponents. There I saw police brutality, the merciless thrashing of students and public political activists, and state oppression at its full extent. There I witness the public response to police brutality and the public throwing bricks, at times at helpless-looking restrained police, as the entire Maclagan Road appeared to be an ocean of bricks from one end to the other. I wondered at that time where the public was getting their unending supply of bricks to vent their anger and fight the state apparatus. In retrospect, it appears that public rage and violence was almost an essential component of political activism in that age and time. Compare the political activism of that age with how the Khan-Qadri activists are expressing their discontent with Nawaz Sharif’s government and demanding a fundamental change in the political system and its manifested political structure. One might completely disagree with the Khan-Qadri political stance, but you will have to credit both the PTI and PAT leadership with inculcating a new sense of civility and consciousness in the conduct of present-day political activism by expression in a most dignified democratic manner. Consider the level of discipline, the non-violent orientation, the crowd’s self-observed restraint, the rigidly sustained public control organization, the limitless public patience, the steadfastness in their political demands in a peaceful manner, the public-leadership communication network, the public clarity of the issues involved, and the public determination and the level of public motivation. Also take note of the behavioral decency on display in this mixed gathering of males and females and the ethical and moral attitude of the participants at large. In fact, the “Azadi-Revolution March” is an altogether new and different phenomenon that has appeared on the political horizon of this nation. It is an idea, in fact an ideology of political activism, whose time has come. But for this phenomenal transformation of public psychology and mob behavior, Imran Khan and Dr. Qadri’s contributions must be admired. In doing so, they have gifted this nation with a sense of public maturity and enhanced democratic values. However, the powers-that-be have tried to reintroduce the theory of fear as an instrument of state power. The Model Town tragedy was an integral component of that particular mindset which believes that terror and fear can be used as a deterrent to subjugate opposition political activists causing them to refrain from making demands. The level of fear for one’s life and making it into a reality is what happened on that tragic day in Model Town. And yet, admirably and steadfastly, PAT political activists have remained non-violent, restrained, and devoted to their political cause. Consequently, national democratic discourse has been set into motion. This, in itself, is a healthy democratic development – albeit, it’s your personal choice to support Khan-Qadri or choose to side with the PMLN leadership. Let us open our eyes and try to understand what is actually happening in Islamabad these days. Realistically, and conceptually speaking, it is not a personal conflict or an individual political confrontation between Nawaz Sharif and Imran Khan or the Sharif brothers and the Khan-Qadri duo. The fact of the matter is that it is the beginning of an openly direct and onerous struggle between two opposing ideas and political ideologies. What Khan-Qadri are saying is this: It is a matter of simple common observation as well as a straightforward scientific/architectural fact that when a crack in a house’s foundation appears, if not repaired, it can continue to expand, ultimately destabilizing the structure and rendering it uninhabitable – eventually, the house will collapse. I believe this analogy perfectly explains the Khan-Qadri demands for a fundamental change in Pakistan’s political system. Both Khan and Qadri wish to repair the multiple cracks that have already dangerously expanded in body politics in this country threatening its ultimate collapse. Both of them are challenging the de facto ownership of this country by the traditional vested interests leadership, the PMLN-PPP and their cohorts, operating within a demagogic status quo socio-economic political doctrine. Let us be fair and honest. Let us not indulge ourselves in a denial discourse. The fact of the matter is that the state of the nation is dismal. The PPP-PMLN so-called democratic leadership has not delivered, even a bit, to repair the growing cracks in the body politics of this nation. They have failed in giving a holistic people-centric democratic governance to this country. The collapse of the house (metaphorically speaking) appears inevitable. That is if you, as a common citizen, ignore to have a meaningful rendezvous with history at this crucial moment of Azadi-Revolution demonstrations in Islamabad. The choice is yours! 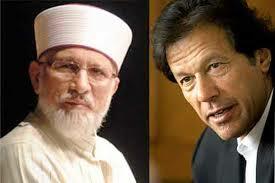 This entry was posted in Dr. Tahir Ul Qadri, Imran Khan, Pakistan Politics by drhaidermehdi. Bookmark the permalink.